Ever wondered of a chess game that lays hidden on your Facebook Messenger?Chess is a game cherished by most of us ,that requires a bit of work for the most important organ,the brain, in our body.It helps you build your intellectual skills and teaches you how to concentrate wisely and tact things in different angles. Facebook Messenger, along with its beautiful social features,news and games has launched chess too.Here we will provide you with the steps to launch chess which may require unlocking it first. 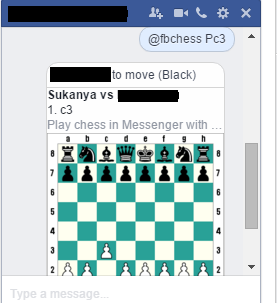 Chess can be played live with your friends on conversation once you have the Facebook Chat messenger available with you.Also it has a prerequisite of typing a phrase first that will help you follow towards the game. Log in to your facebook account and pick up a friend to start your conversation. 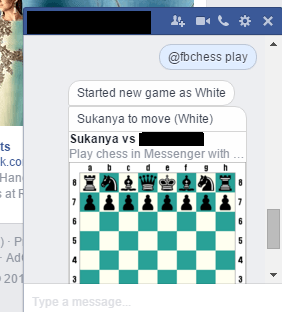 While conversing with your friend with whom you want to play the chess game, you will have to type the phrase @fbchess play in the chat window.This launches the game on your chat window as shown. Depending on whether you play on your desktop or your mobile app, your friend gets to play first. Now,you need to remember certain notations you need to follow while playing it.They help you specify the piece which you want to move. Each of the above can be moved by making use of commands which involves letters and numbers that will specify the space to which you want to move the particular piece.For example, @fbchess Qc4 moves the queen to that space. If more that one space is available for that particular move, you will have to select the specific choice. 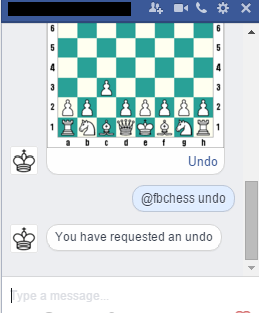 If you regret your move, you can always type the phrase @fbchess undo which undoes your move.But this requires the opponent to approve your request. You can have the chess played in a full screen by tapping on the chat menu settings icon and selecting View Full Conversation part. Hope you had a good fun reading it.Do try it out and enhance your skills. !